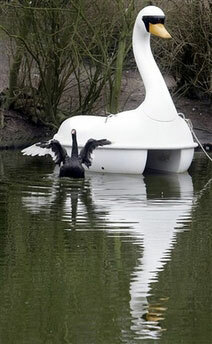 In a bizarre story out of Muenster, Germany, a black swam will be reunited with its companion — a paddleboat shaped like an outsized white swan, reports the Associated Press. Petra, a black swan, apparently became so enamored with the paddleboat that she refused to leave its side at a lake near a zoo in Muenster. Eventually Petra and the boat were tane to the zoo. Last week zoo offcials attempted to pair Petra with a real-life white swam, while removing the paddleboat. The new swan quickly rejected Petra, leaving her “lonely” and “swimming around in an agitated state” according to a statement from the zoo. The zoo has decided to reunite Petra with her paddleboat Friday. A baby hippopotamus that survived the tsunami waves on the Kenyan coast has formed a strong bond with a giant male century-old tortoise, in an animal facility in the port city of Mombassa, officials said. The hippopotamus, nicknamed Owen and weighing about 300 kilograms (650 pounds), was swept down Sabaki River into the Indian Ocean, and then forced back to shore when tsunami waves struck the Kenyan coast on December 26, before wildlife rangers rescued him.